The National Union of Somali Journalists (NUSOJ) reported and condemned brutality by government military soldiers on 18th February 2019 that targeted two local journalists in Mogadishu. Said Warsame Sabriye and Abdullahi Dahir Abdi were allegedly handcuffed and beaten by security forces while collecting vox pops from residents who have affected the Mogadishu city lockdown earlier that week. in which Prime Minister Hassan Ali Khaire laid a foundation stone for a new road construction which leads to the Somalia’s capital Mogadishu. According to one of the journalists, they were invited at 6 am to cover the event. On arriving at the venue, they waited until 1 pm when the communication officer from Prime Minister’s Office informed members of the independent press to leave and that the Prime Minister's office would later distribute the edited footage from the scene. A Somali-born U.S citizen, Abdi Hassan, was arrested in the United States in connection with the kidnapping of a freelance journalist in Somalia. Although the identity was not disclosed, the victim is believed to be Michael Scott Moore, who was kidnapped on 12th January 2012, while working on a book about piracy, and held captive for almost three years, allegedly by Hassan and his co-conspirators, who demanded USD $20 million in ransom. 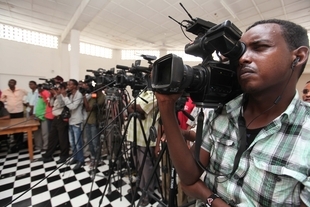 Media professionals in Somalia and Somaliland continue to face threats, intimidation, arbitrary arrests, and judicial persecutions as a result of their work - these attacks are often perpetrated by both State and non-state actors. BREAKING: A court in the self-declared republic of #Somaliland has suspended a leading newspaper (Foore) over its critical reporting of a new presidential palace being built in Hargeisa. The paper’s chairman has told @BBCSomali they also paid three million shillings in fines. On 10th February 2019, a regional court in Somaliland ordered the suspension of the privately-owned Foore newspaper, for one year for publishing “false news”. The newspaper’s editor-in-chief Mohamed Mohamud Yusuf also received a fine of three million Somaliland shilling ($300), after being found guilty of publishing fake news and anti-government propaganda. The charges relate to Foore's coverage of the Somaliland government, including an October 2018 story on the construction of a new presidential palace. Mohammed informed CPJ that they plan to appeal the decisions. "Somaliland is using problematic sections of the penal code on false news and propaganda to hack away at the basic freedoms the press needs to hold government leaders accountable. The ruling against the Foore newspaper sets a dangerous precedent that anyone questioning the state's version of the truth can expect to pay a heavy price…. We call on Somaliland authorities to uphold press freedom by dropping these charges on appeal". On 12th January 2019, Somaliland poet Abdirahman Ibrahim Adan, was detained at the Lake Assal Hotel, after he recited a poem on 11th January in Hargeisa, that highlighted several human rights concerns around police brutality, arbitrary detentions and poor leadership. Adan was arrested without a warrant of arrest and detained at the Counter terrorism Unit of the Criminal Investigation Department in Hargeisa. His family and lawyer were not allowed to see or talk to him. There is limited space for CSOs to operate due to the armed conflict in many parts of the country, though associational rights are technically guaranteed in the provisional Constitution. There is limited space for CSOs to operate due to the armed conflict in many parts of the country, though associational rights are technically guaranteed in Article 16 of the provisional Constitution of 2012. Operating without adequate oversight, the national intelligence agency routinely arrests and detains human rights activists, often with no formal charges pressed against them. Many Somali CSOs now operate from Kenya because of numerous incidents of attacks, abductions and killings of CSO employees. Authorities also use the 1962 Penal code to harass human rights defenders, bringing charges against which include “instigation to disobey the laws and “publication or circulation of false, exaggerated and tendentious news capable of disturbing public order” among others. Somalia also remains a dangerous place for international and domestic organisations working to address the country's serious humanitarian issues. Aid workers are constantly under threat, especially when carrying out fieldwork and in the southern parts of Somalia where the armed group Al-Shabaab dominates. The authorities rarely respect the freedom to assemble peacefully. The authorities rarely respect the freedom to assemble peacefully even though this right is enshrined in Article 20 of Somalia’s constitution. Protesters have been killed or injured by security forces using live ammunition to disperse them. Further the authorities regularly denies requests to gather, even if those meetings are small scale and held indoors. The state also has been reported to intimidate and threaten leaders of the Federation of Somali Trade Unions and the National Union of Somali Journalists. Attacks on journalists continue in Somalia, although the provisional Constitution protects free speech. Attacks on journalists continue in Somalia, although the provisional Constitution protects free speech. The Al-Shabaab armed group prohibits journalists from operating in areas under its control and continues to detain, threaten and harass media workers throughout the country. Journalist have been arbitrary arrested in response to their investigative and critical reporting of the government or just questioning government officials. They have also faced violence and threats from government and non-state actors including kidnappings and attacks, including from Al-Shabaab.